It’s nine games into the season, and a lot of things are working very well for the Oakland Raiders. At 7-2, they have an offense with young, dynamic playmakers and a defense with one of the best players in football in Khalil Mack. Perhaps one of the most improved aspects of the team is its running game, a weak link in 2015. 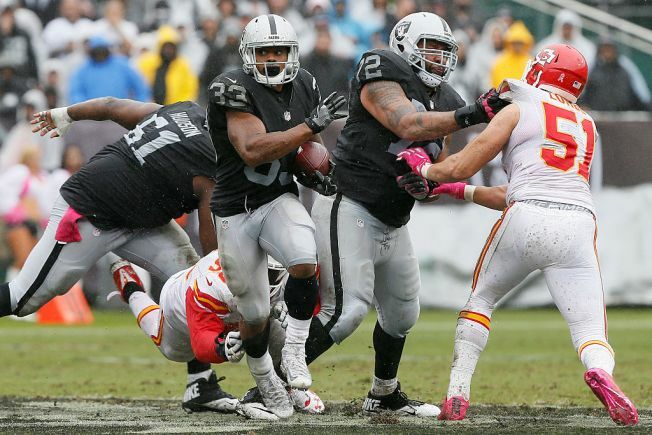 Last season, Oakland ranked 28th in the NFL in rushing with just 91.1 yards per game and 3.9 yards per attempt. This season, it’s a different story, and one that a scan of the NFL individual rushing leaders won’t tell. Raiders lead running back Latavius Murray ranks just 23rd in league with 393 yards. But as a team, the Raiders rank fourth, rolling up 127.8 yards per game and 4.8 yards per attempt. It’s a testament to Oakland’s physical offensive line and a trio of running backs: Murray and rookies Jalen Richard and DeAndre Washington. Washington is 29th in the NFL with 302 yards and a 4.9 average; Richard is 35th with a 6.5-yard average. The combination of the big, powerful Murray and the smaller, quicker Washington and Richard is giving Oakland a trio of backs to use throughout the game. Defenses have to contend with a group that stays fresh and has a diverse blend of talents. Even against an elite defense such as the Denver Broncos this past Sunday night, the Raiders rushed for 218 yards, with Murray crashing into the end zone for three touchdowns. Head coach Jack Del Rio says having a trio of backs has been a blessing. So far in 2016, the Raiders have done just that. And, with the Houston Texans next up on the schedule – after a bye this weekend – the Raiders may be able to rely on their ground attack to have a big game. The Texans rank just 28th in the NFL in run defense, allowing 4.4 yards per attempt and 125.8 yards per game.